Do I Need Council Approval? If you are thinking of installing a pool shade, you have come to the right place! The following article is a concise list, outlining the 5 most popular pool shades available today. 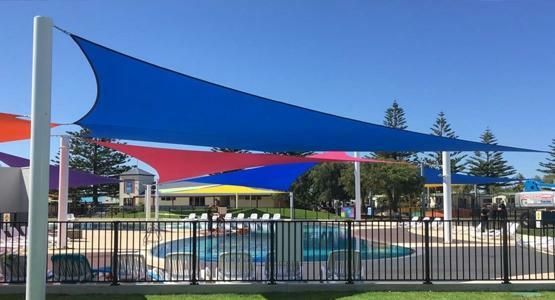 Custom-made Shade Sails, Cantilever Umbrellas, and other Pool Shade Structures are just some of the designs available. No matter what budget you have there is a solution to fit your home. 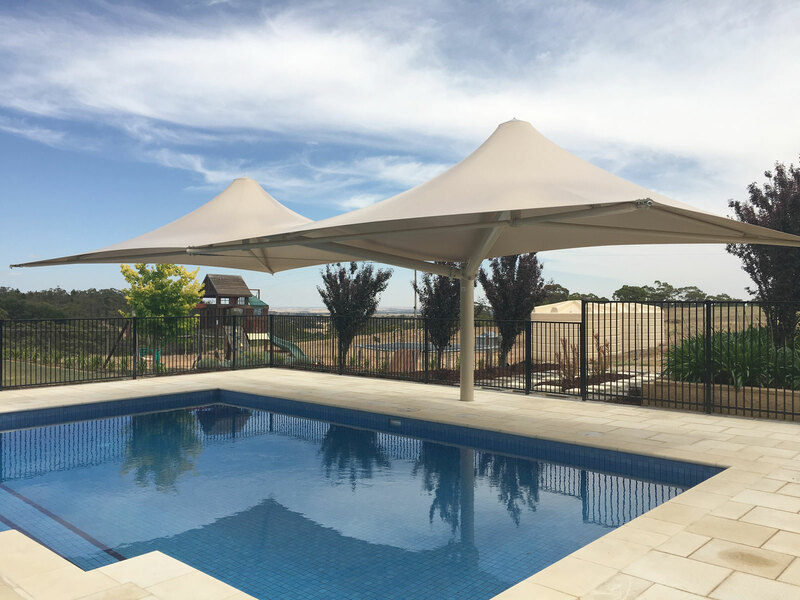 We will start with the more economical solutions and work our way up to some of the most premium pool shades available in Australia. 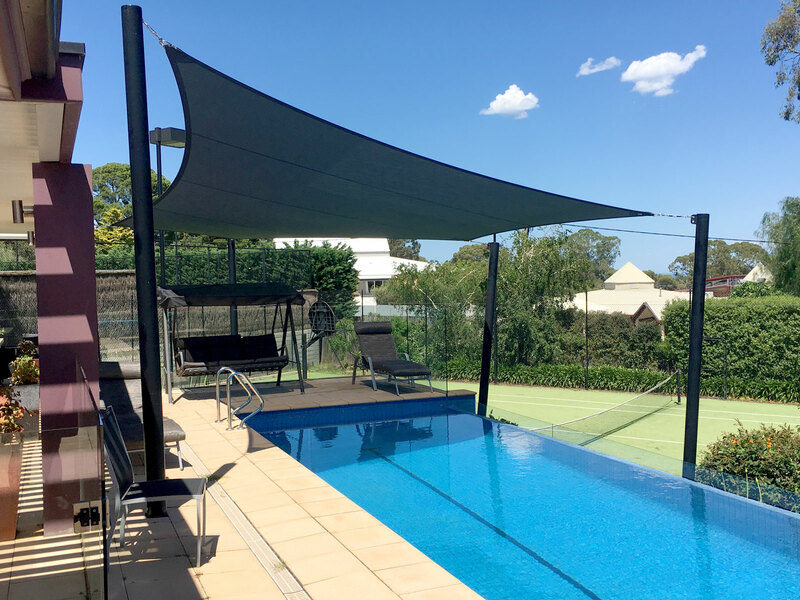 There are many types of pool shades on offer, but none are as elegant and offer as much value for money as a custom-made Shade Sail. 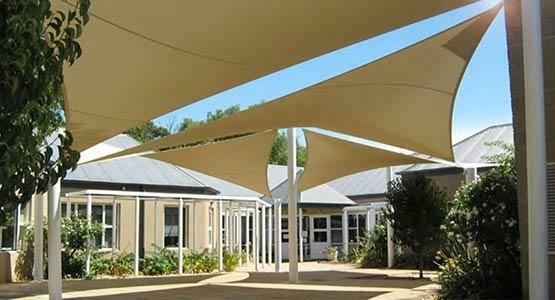 The Shade Sail first originated in Australia in the 1980's as a quick and easy way to create shade. 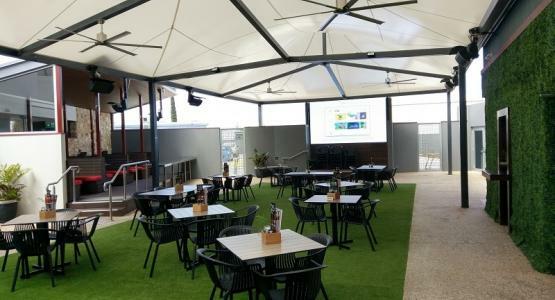 Fast forward to today and now you can get architecturally designed Shade Sails, that form visually stunning centre pieces in their own right. 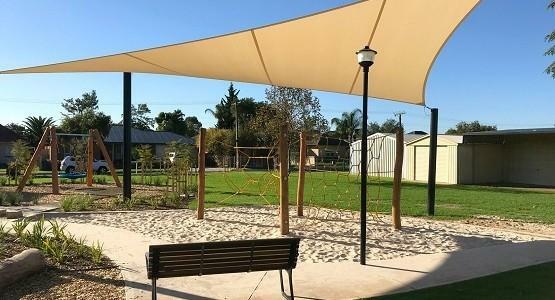 Shade Sails are a great provider of shade and as such they help keep outside areas cool. You can even protect against the rain, using a waterproof PVC fabric. 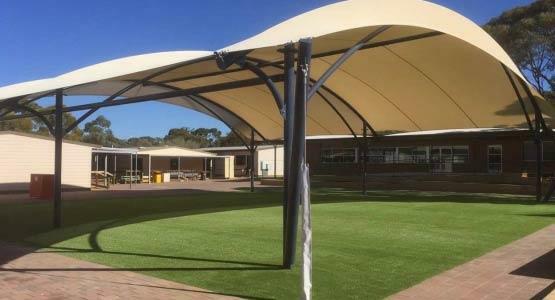 The best of both form and function, Shade Sails look fantastic in any setting! 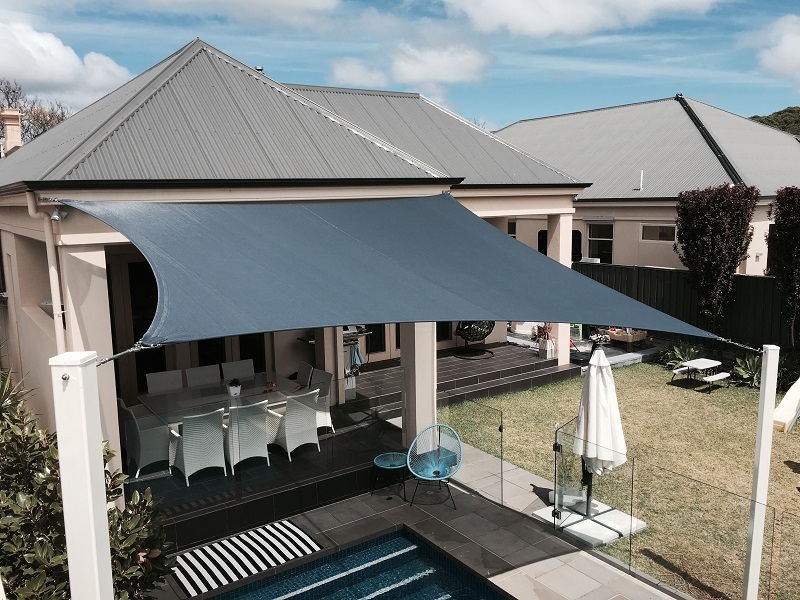 By installing a Shade Sail in your own home you can create a feature, something that helps lift the whole look of your outside area. Taking inspiration from yacht sail making techniques, a Shade Sail is typically constructed from high quality shade-cloth fabric. Using stainless-steel wire edge, fixings, and fittings, the sail is pulled tight to form a strong and robust canopy. Each sail is 3D-designed using computer software and each panel is stitched, sewn, or welded together to create a single Shadeform Sail. The end result is a tear resistant sail with minimal puckering and almost zero sag. Warranties are available up to 15 years depending on which fabric you choose. 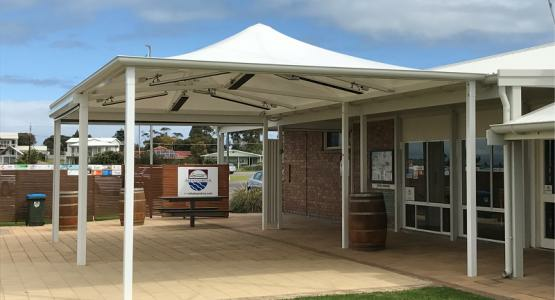 A Retractable Sail is made from the same high-quality shade cloth as a fixed Shade Sail, and as such it provides the same high level of weather protection. Waterproof fabric options are available, and each Retractable Sail can be custom-made to suit a particular area. Shadeform’s very own Retractable Sail - the Shaderunner® - is a unique and effective solution that has been refined for over 10 years. The Shaderunner® glides in and out using pulleys and stainless-steel support wires. A simple rope system is used to pull the Shade in and out. Motorized options are available including a wireless push-button remote. With the flexibility to move the Shade in and out when you want it, the Shaderunner® is the perfect solution for pools and patio areas. When it’s hot outside you can extend the Sail to reduce temperatures and make outside areas nice and cool. Then when it gets a bit cooler you can retract the shade and let sunlight and warmth in. The Shaderunner® is a fantastic all-round performer with many benefits. Create shade, aid in pool heating, help stop evaporation, and protect from harmful UV all-in-one! 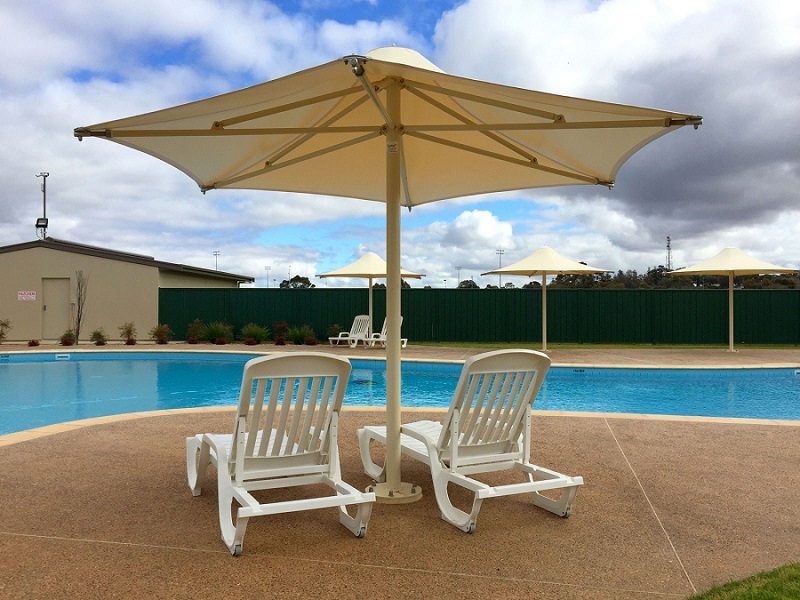 The gold standard when it comes to pool shade structures, a Permanent Outdoor Umbrella is a fantastic option. The main benefit is that they can provide up to 50m2 of protection with a single support column. 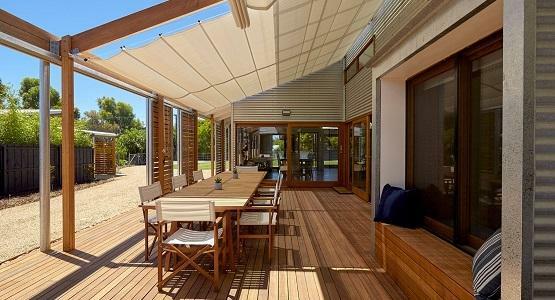 Furthermore, Outdoor Umbrellas have a minimal design, which is a great compliment for modern homes. 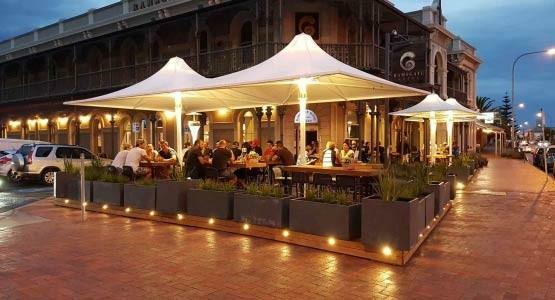 These features allow the Permanent Outdoor Umbrella to effortlessly tie-in with existing surrounds. Offering high levels of sun and rain protection, a Permanent Outdoor Umbrella is the perfect set and forget solution. Why Choose a Permanent Outdoor Umbrella? Not all pool umbrellas are created equal. The difference between a standard market umbrella, and a Flexshade® Permanent Outdoor Umbrella, is night and day. A market umbrella typically uses a small separate weight for support, or sometimes nothing at all. This is a less than ideal situation, as market umbrellas have to fold down or be taken away at the slightest sign of breeze. A Permanent Outdoor Umbrella, however, uses a large concrete footing (often 1cbm or more) that is dug deep into the ground. This makes the umbrella a permanent fixture, able to withstand cyclonic winds. This means that if you install a Permanent Umbrella, you wont have to worry about it again for a very long time. There is very minimal maintenance and in turn this give you piece of mind. If you would like the option to offset the support column, you can chose a Cantilever Umbrella. This provides more living space under the actual shade, allowing you to move more freely with no support column in the way. Some Cantilever Umbrellas also have a Pivot option, allowing you to spin the Umbrella canopy around on its column. 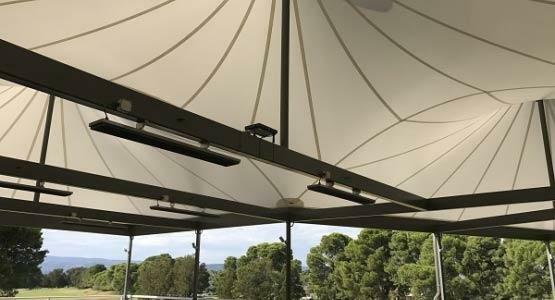 This allows you to move the shade as the sun angle changes, ensuring you are well protected throughout the day. 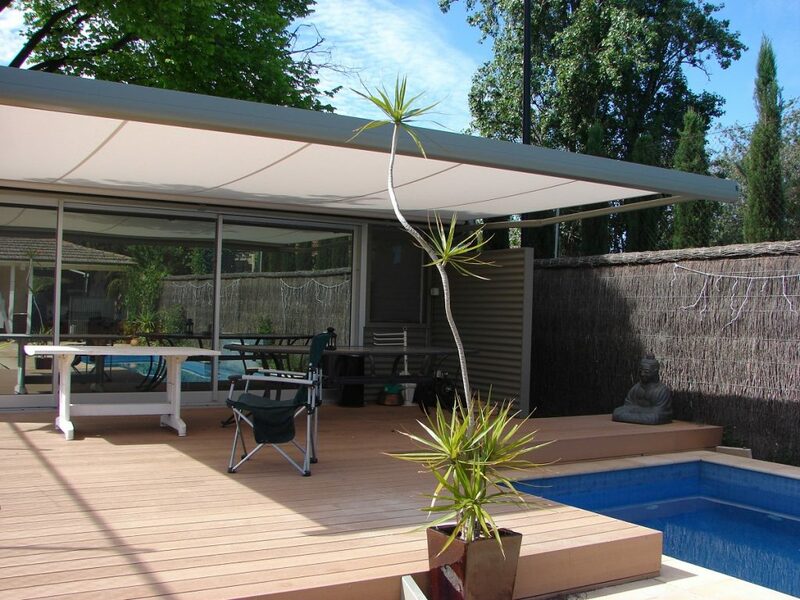 There are few pool shade options that eclipse the stunning visuals of a Cantilever Umbrella. Using large pier footings that run up to 2.5m deep into the ground, you can support even the largest Umbrella. When using flexible fabric like shade-cloth or PVC fabric, the sky's the limit! Whatever your shading requirements are, you can build just about any design you want. 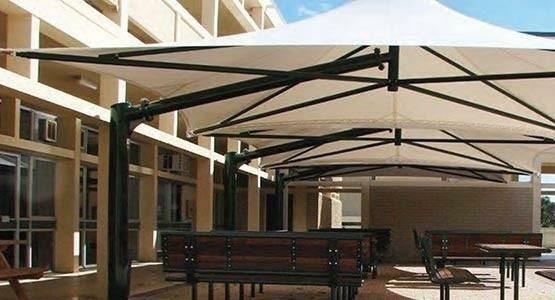 Using custom made powder-coated steel frames, a fabric canopy can take on any number of configurations. Skillion, barrel-vault, apex, and other roof layouts are all possible. 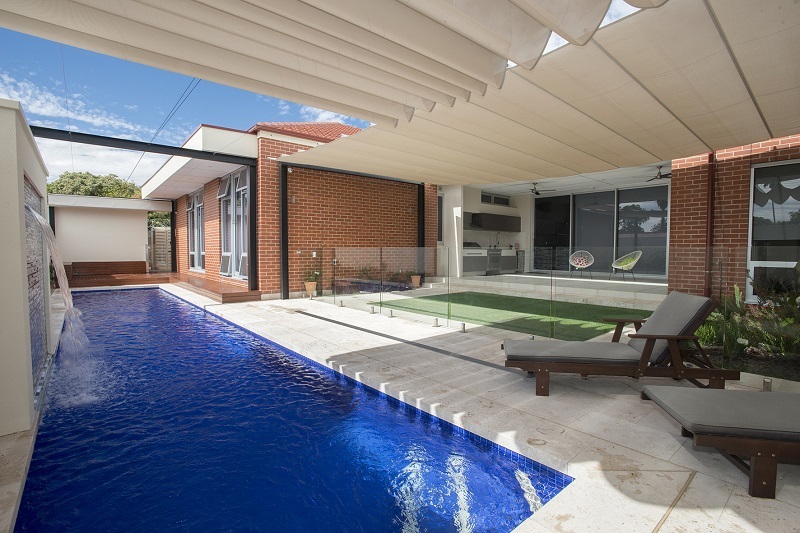 The above picture shows a unique pool shade - a cantilevered Shaderunner®. This is the special combination of a Retractable Sail and a cantilevered frame structure. Shadeform are proud to deliver an unprecedented project like this, proof that shade design is limited only by your imagination! 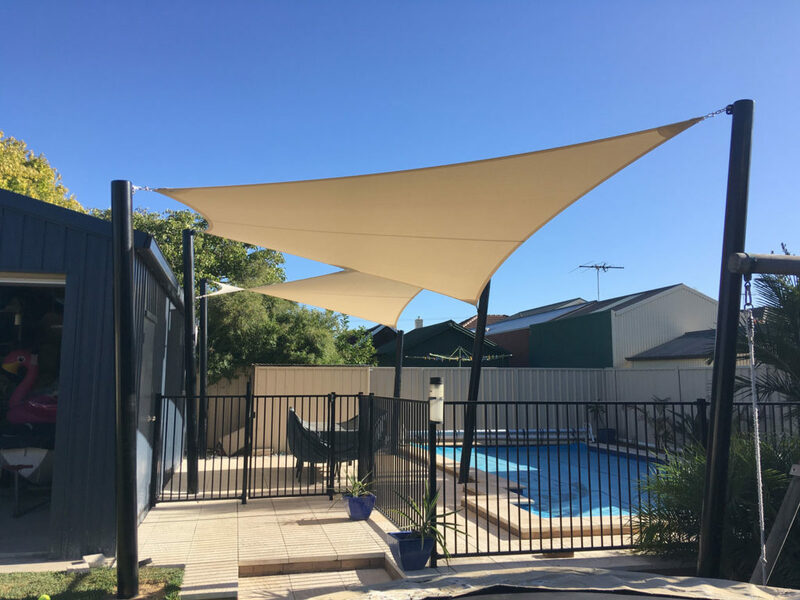 If you are after a pool shade that has style, with loads of functionality built in, then you simply must consider a Folding-arm Awning. 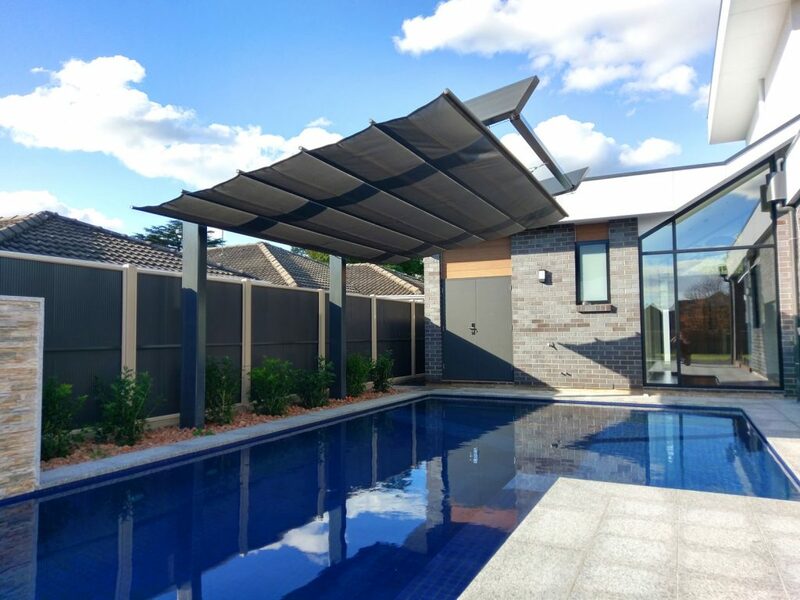 Providing fantastic weather protection on demand, the Issey® range of Australian-made Folding-arm Awnings are the perfect solution for pools. A robust aluminum case plus a water resistant acrylic canvas, these shades offer some of the highest quality and workmanship available. A minimalistic design with a completely protected headbox, Issey® offer a sleek and elegant Folding-arm Awning. Quality Somfy electronics work each time, every time, allowing you to retract the Awning at the push of a button. If you're after a more economical solution, consider a manual crank operation instead. Home automation options are available, including the ability to control your awning using a smart-phone. Other impressive features that are available include safety sensors, which pull the shade in before wind damage can occur. If your patio area needs shade, as well as your pool, it may be worthwhile to shade the whole area using one shade. Separate patio shades or patio awnings will cost approximately the same amount as your pool shade, if they are of similar size and layout. Therefore, it makes sense to shade the whole area in one go, as you can save on cost by installing only one shade. To do this is very easy, simply designate a poolside area to be shaded and then include this area, as well as the pool area, in your chosen design. If you can - try to keep your shade under 7m in length or width. This helps keep post and engineering costs down, giving you better value for money. If you need to shade a larger area, consider splitting the area up into multiple shades. Even if the shades are separate, you can share columns and posts, minimising overall project cost. Also, don't forget that all posts and support columns should be more than 1m away from your pools edge, to avoid footing movement. Contact Shadeform now for your free quote! © Shadeform 2019. All rights reserved. Website Built by Sleek Websites.